Frenchie, a 16.2 hand chestnut gelding owned by Amber Lee in Aiken, was born to jump. A Selle Francais, he is descended from a long line of successful showjumping horses. His sire, Oberon du Moulin, had a brilliant career, earning over $180,000 on the European Grand Prix Circuit before retiring to the breeding shed. Frenchie, properly called Espadon V, is one of his most illustrious offspring. Born in France in 1992, Espadon V had enough talent and class to make it into the string of one of Europe’s most accomplished showjumping riders, Ludo Philippaerts. Ludo, who retired from showing in 2015, was a 7-time winner of the World Cup and a regular on the Belgian international showjumping team, competing at the Olympics four times and the World Equestrian Games twice. Ludo showed Espadon V at top competitions around Europe from 2000 to 2001, racking up an impressive record. This included wins in international Grand Prix and other showjumping events in Montecarlo, Maastricht, Oslo, Geneva and Aachen. He also had top placings in Paris, London, Berlin, Stuttgart, San Patrignano, Arnhem, Neuendorf and Rotterdam. 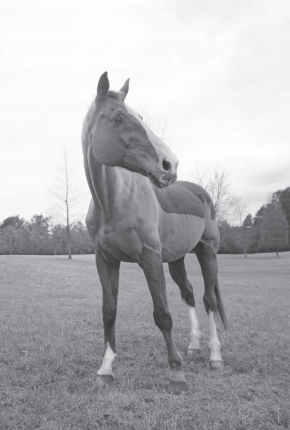 Espadon V came to the United States in 2002 to compete for his owner, the Pennsylvania-based Penlyn Farm, under the American showjumping rider Candice King. Candice, who has been the topplaced U.S. rider in FEI Show Jumping World Cup competition, traveled the Grand Prix circuit up and down the East Coast, and Frenchie did her proud. His biggest win for her was at the $40,000 Merrill Lynch Cleveland Grand Prix in 2002, an event in which Candice set a record by finishing first through fourth on four different horses. 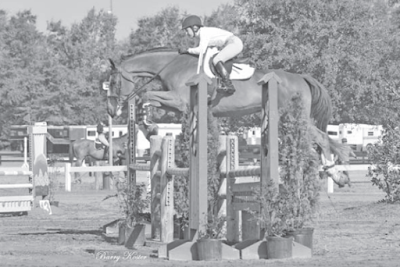 Espadon V jumped at Devon, the Washington International, the Winter Equestrian Festival, Tampa, Atlanta, the Hampton Classic, the American Gold Cup and more. In 2003, he left Candice’s string to compete in Level 7 jumpers under Michael Walton on the Florida and Pennsylvania circuits. Espadon V was not just a talented jumper, he was also a kind and forgiving horse with a generous and friendly personality. All of those qualities made him an ideal mount for a young rider. In the next phase of his career, he was back on the international circuit, this time in the junior divisions. 2007 found him in Germany, where he competed under the German Young Rider Julia Schönhuber, who was born in 1992, the same year he was. The pair showed extensively together for a little over a year. 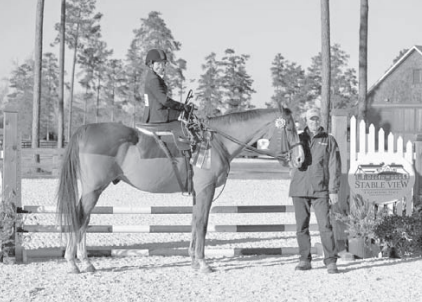 Their biggest accomplishment was coming in second in the European Young Rider Championships in August 2007. In 2009, the horse was back in the United States showing in the children’s and junior divisions with Lauren Cortellessa. They went to prestigious shows such as the Lexington National and the Upperville Colt and Pony Show. Bob ended up leasing this wonder horse for a time, and then finally buying him. Bob was 64 and Espadon V was 18, and, over their next four years together, they competed at some unrecognized shows, both in Pennsylvania and in Aiken. While under Bob’s ownership, the horse got his new name (“He was a Selle Francais and my wife started calling him Frenchie and it stuck,”) and he tried some new things. He took to some of those things right away; others not so much. For instance, Bob took him to an unrecognized dressage show in Pennsylvania, a first for both horse and rider, and they won the class. Going for a hack in the Hitchcock Woods with one or two other riders was enjoyable, but if there were too many other horses around, Frenchie didn’t like it. Bob tried to take him foxhunting with Whiskey Road, but Frenchie wasn’t keen on that at all. And if there was a puddle on the trail? Forget about it. Jumpers are trained not to put a foot in the water, and for Frenchie, that was a rule that held, in or out of the show ring. Although he was officially an equine senior citizen by this time, Frenchie knew he was a show horse and he always remained a professional. During his winters in Aiken, Frenchie met his next owner, Amber Lee. Amber, who rides horses of all kinds for many people in the Aiken area, took a job riding Frenchie to keep him exercised for Bob. Amber has a reputation as a quiet and tactful horseman, and many of the horses she rides are young, green, hot or difficult. For her, riding Frenchie was like going on vacation. Bob knew how much Amber loved riding his old horse, and so, at the beginning of 2014, he offered to let her have him. Although Frenchie was 22, he was still healthy, sound and energetic, and so Amber took him back to the show ring. In 2014, they competing in the 3-foot low jumpers, hunter paces and combined tests. In 2015, Amber decided to pursue points with him in the Progressive Show Jumping series at Highfields and ended up placing fifth for the year in her division. She even learned to ride sidesaddle on him, and competed in the sidesaddle classes at the Memory Ride Hunter show in September, as well as at the Southeast Hunter Trials at Stable View in December 2015. In that show, Amber was the sidesaddle champion. As of January 2016, Frenchie is officially retired. He was still absolutely sound and healthy after his final show in December, and Amber wanted to assure him happy and healthy golden years. He now lives turned out with a retired 17 hand Trakehner dressage horse named Ozzie. Amber visits him regularly to give him peppermints and to curry him. “He knows he is retired, and he’s enjoying it,” says Amber. Before she got him, he had lived the life of a high end show horse, and never had much time for turnout. When Amber first owned him, she introduced him to the concept of pasture board, and to the benefit of having a pasturemate. He was so thrilled with his new freedom and so happy to hang out with another older horse, sometimes he was reluctant to let her catch him when she came to ride. Now that he knows he is retired, he is always happy to see her and comes over to ask for a scratch or a treat. At 24, Frenchie is the picture of health and contentment. Through his long show experience, he saw more of the world than many people ever will – his official horse passport reads like a travelogue. Amber Lee took on his ownership at the very end of his career, at an age that might have scared off most riders, who can be so focused on what they might do tomorrow that they forget about today, overlooking the gifts an experienced horse can offer. Is it worth it to take on such an old horse? For Amber, the answer is an unequivocal yes. -Three Runs Plantation Equestrian Blog. Re-published article from The Aiken Horse. EQUUS Consultants | Allergy to Vaccines?